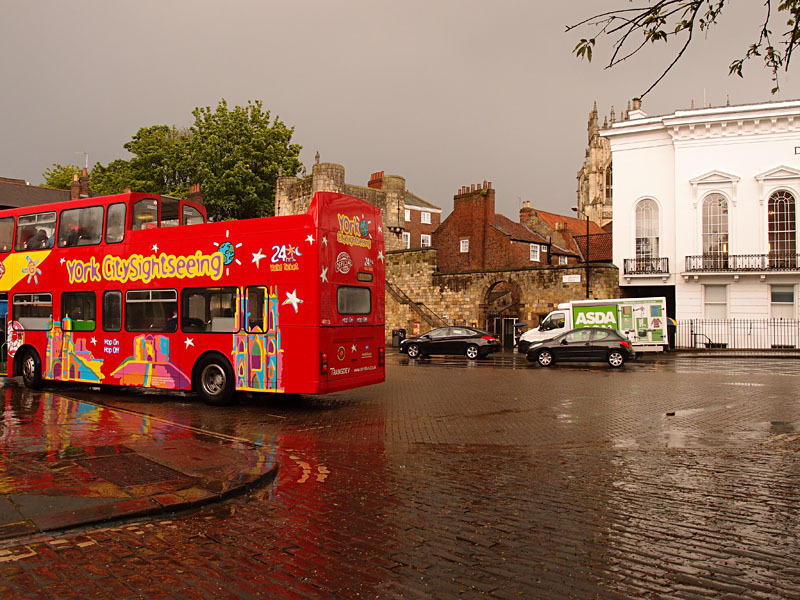 The ‘reinvigoration’ of King’s Square was rather controversial. In particular its repaving. 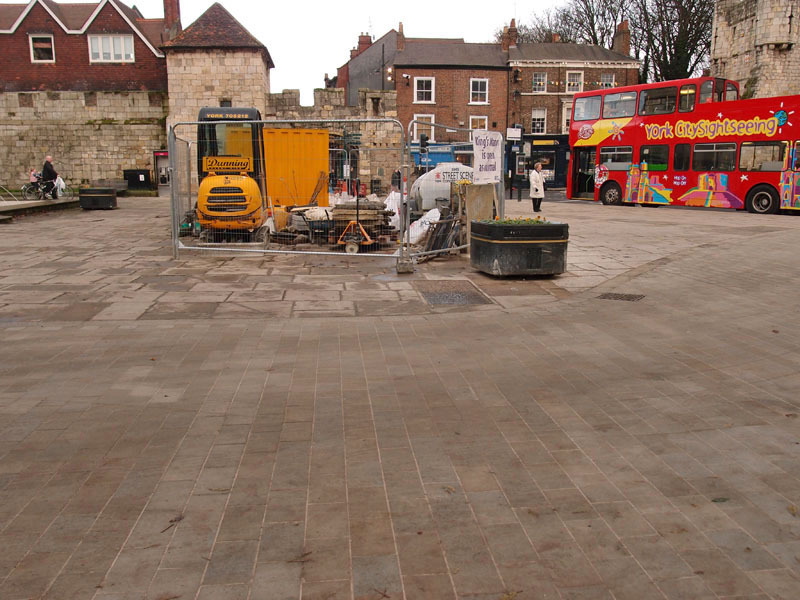 Apparently less controversial, indeed barely noticed or mentioned as far as I can see, is the repaving work recently completed in Exhibition Square. 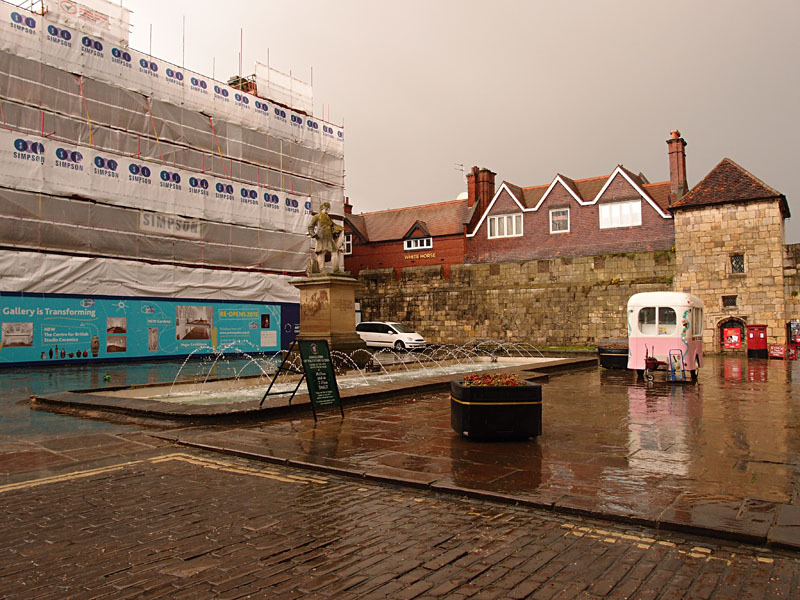 Though I didn’t like the idea of Etty being shunted off to the side of the square, as one of the proposed schemes had suggested, I wasn’t too bothered about what the paved part and bus part looked like. But the change is interesting, now it’s in place. 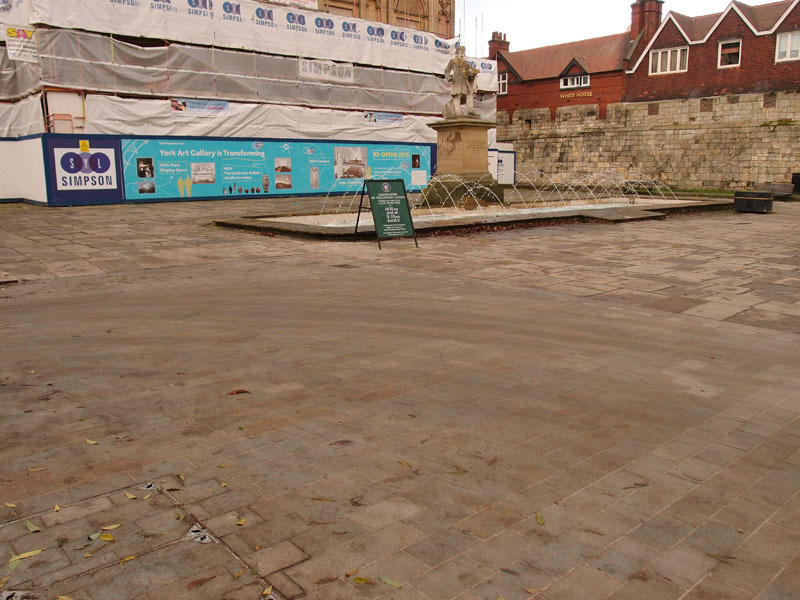 The square now appears bigger and flatter and paler, like King’s Square. I guess it’s supposed to look like another ‘world class space’. 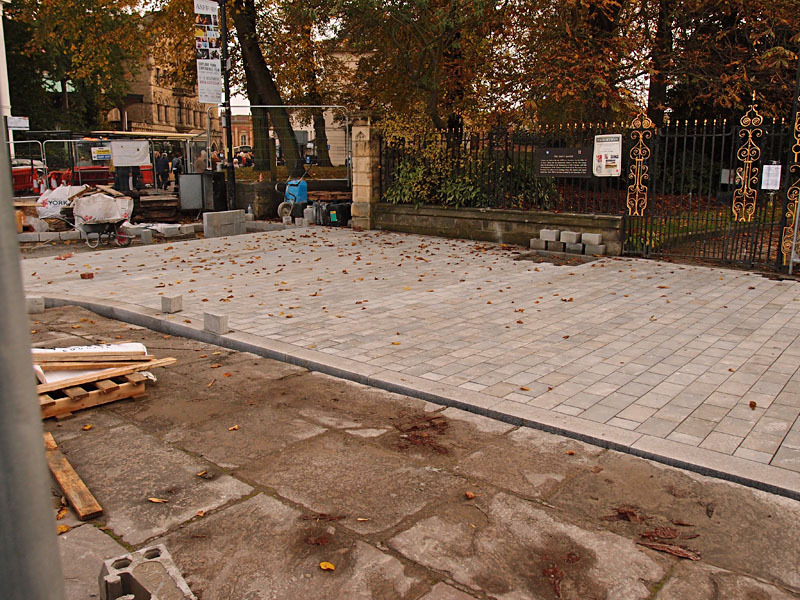 The same type of stone has been used as in King’s Square, to extend out from the existing slabs, most of which have been retained, though the smaller setts have been replaced. I’ve taken a few photos of the square over the course of this year, when passing. As the proposed changes focused my mind on the place I thought I’d focus my camera on it too. Here are a few ‘before and after’ photos. 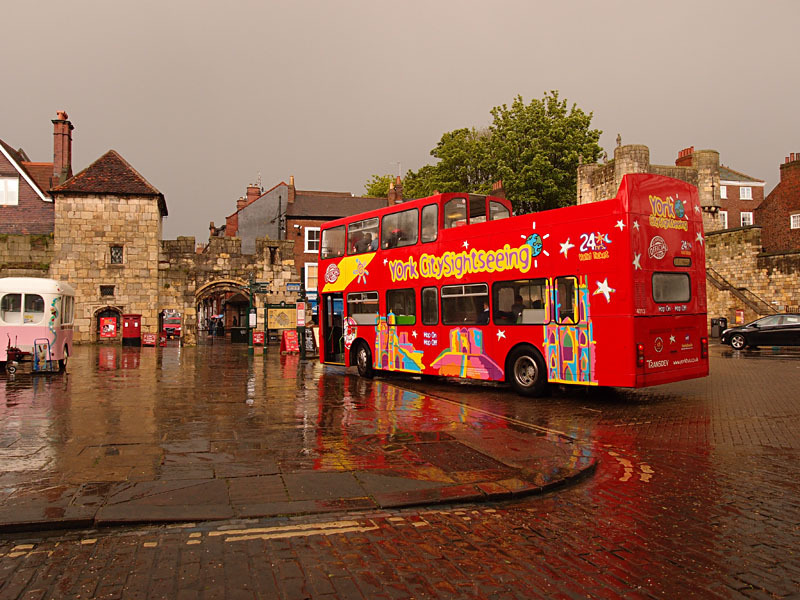 Here’s how it looked on a rainy day in May. I was standing by the gate to King’s Manor. Small rectangular setts with the shabby remnants of double yellow lines marked the access road into King’s Manor. 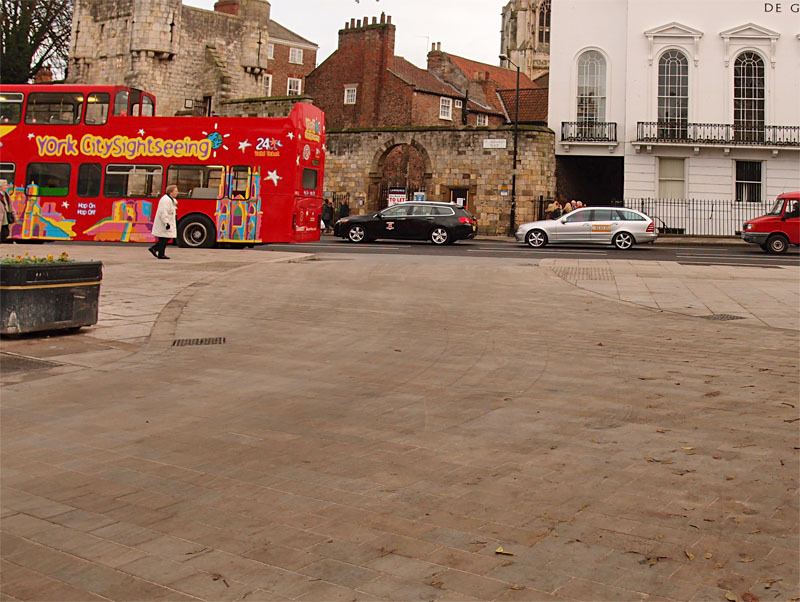 I guess that these setts, like the King’s Square ones, were laid in relatively recent decades, perhaps the 1970s. 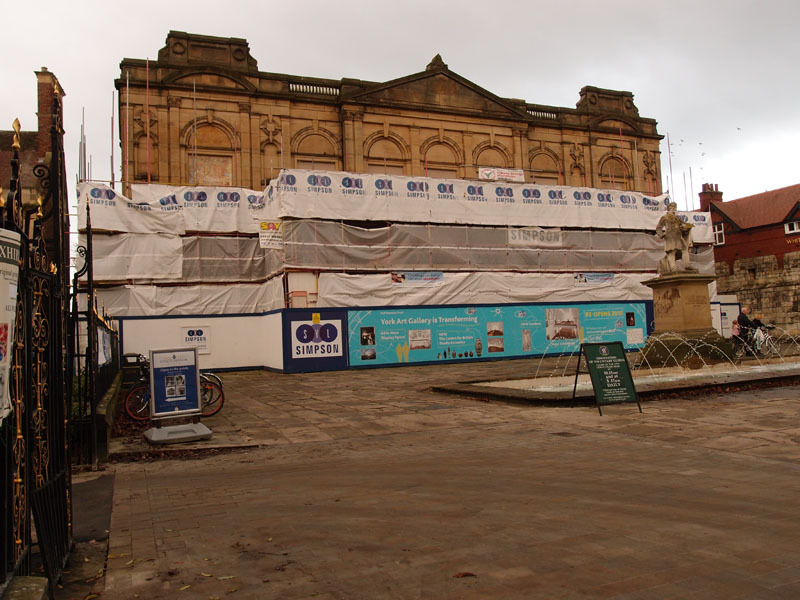 Photos of the square over the course of its history show various changes. Walking across this area is much more pleasant now, and presumably more widely accessible to everyone, as the step of kerb has been lost and these new setts are completely flat and smooth. Illustrating the way the bus pull-in has been reduced. 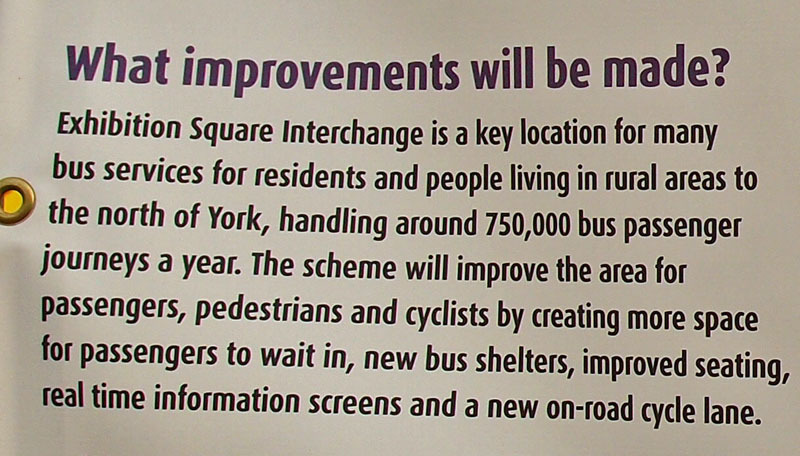 It doesn’t really make sense to me, that the space for buses seems to have shrunk, rather than increasing. Presumably it works better and they know what they’re doing. I’m not a bus driver or someone who catches buses here so I can’t comment. I only notice the pedestrian perspective. Which is that it’s nice and smooth to walk on. Oh yes, that reminds me, there’s a cycle lane too, indicated with new road markings on the tarmac rather than road widening. The information sign also answered the question of how much all this cost. Well, kind of. And the plans for the other part of the square, Etty and the fountain? I don’t know. They’re both staying, I hope. Personally I’m not convinced that the fountain is destroying Etty, and even if it is, maybe we should just let that happen. Let him fade, naturally eroded. And photograph the two of them at regular intervals and turn it into some kind of art project, and put it in the gallery behind him. He might like that. Good point Mick,suppose a city that has lost its engineering and manufacturing ethic,replaced by tourism,has no option but to knock down /replace/repave, to maintain visitor attractiveness.Pity about the rock bottom wage structure inherent,for those who have no other choices! I like the extra space & accessibility – And think Etty should stay! Keeping a watchful eye over the city.